Each month, a Texas Tech University Health Sciences Center El Paso employee who contributes to the university’s Employee Giving Campaign will be featured. Participating in this campaign sends a powerful message to the community that employees not only work here, but also truly believe in our mission to serve all people through exemplary patient care, education and research. This month’s employee is Ana Alvarado, Unit Supervisor, General Services. If Texas Tech University Health Sciences Center El Paso had a cheer squad, Ana Alvarado would definitely be the captain. She started wearing red and black, the university’s colors, as a daily uniform, and soon her coworkers followed suit. Alvarado speaks enthusiastically about how much the university has grown in her 11 years as an employee. 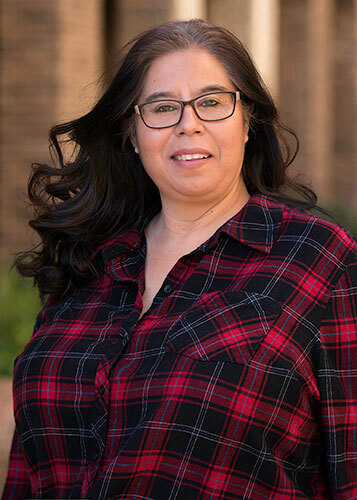 And her familiarity with TTUHSC El Paso’s history goes back even further, as she grew up in the neighborhood and attended nearby Jefferson High School. One of her strongest passions is her belief in giving back, whether it’s to the community or to the university. Alvarado designates her Employee Giving Campaign contribution for the Paul L. Foster School of Medicine. Alvarado believes in the positive power of good deeds and the principle of caring for one another. “These students really need our support, especially because there are a lot of students that come from out of town,” Alvarado. Alvarado also helps to give back through her participation in the Staff Senate, which has collected backpacks, school supplies and toys for school-age children in need. Helping others is something she learned from her parents, and she is passing along this spirit of generosity to her own children. Alvarado would like to see more employees give back to the university through the Employee Giving Campaign. Giving back has never been so easy now that the Employee Giving Campaign form is online. Click here to join the Employee Giving Campaign.